constructed to maximized fusion yield. help to determine fabrication quality. The NCI goals are to strengthen research and development collaborations in the field of NDC between LLNL, government, academia and industry. Using multidisciplinary and systems-based approaches, we seek to understand and solve diverse NDC problems. 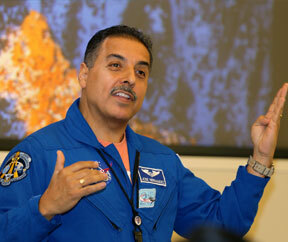 José M. Hernández, Engineer turned NASA astronaut inspires employees to "reach for the stars"
José has formed the Reach for the Stars Foundation to encourage STEM education for all children. What is Nondestructive Characterization (NDC)? A scientific discipline that aims to understand the internal physical properties of a material, component or system without causing damage. 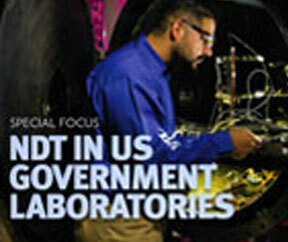 Why NDC, and not NDT, NDI or NDE (Testing, Inspection, Evaluation)? We chose to use Nondestructive Characterization because our focus is often on quantitative physical properties like density, atomic structure, radioactivity, etc. NDT, NDI or NDE refer to important work in standards and certification done by organizations like ASNT for such needs as weld certification and crack or flaw detection. Much of our R&D extends to the next level, where we characterize all aspects of an object compared to what was expected (“as-built” vs “as-designed”). How do you Characterize something? Similar to medical diagnostics, we use many forms of active (x-rays, gamma-rays, microwaves, ultrasound, etc.) and passive (e.g., radioactive or acoustic emissions) measurements combined with physics-based analysis to do comprehensive NDC.